Israel has filed a complaint with the UN against Syria and Lebanon in the wake of bloody incidents Sunday on its northern borders, a spokesman for the Foreign Ministry said Monday. Meanwhile the IDF's Northern Command announced it would begin to investigate the violent occurrences that took place during 'Nakba Day'. "We filed a complaint with the presidency of the Security Council and Secretary General of the United Nations against Syria and Lebanon, who are responsible for violating our borders, international agreements and UN resolutions," the spokesman told AFP. "Israel warned the UN and the international community that May 15 would be a volatile day, including attempts to engage in provocative forms of violence." He said that "the Syrian and Lebanese authorities have done nothing to fulfill their responsibilities despite the warnings". Protesters marking 'Nakba Day' stormed Israel's borders with Syria and Lebanon Sunday, prompting clashes with the IDF as well as the Lebanese army. Four Syrians and at least six Lebanese civilians were killed, and dozens were injured. "The Israeli army has acted with restraint and we hope that calm will return as soon as possible to the borders," the spokesman said. UN Secretary General Ban Ki-moon urged Israelis and Palestinians Sunday to exercise restraint to avoid further hostilities. The violation of the border came "from the Syrian side," said a UN statement. Lebanon, for its part filed a complaint against Israel to the UN Security Council calling to "take responsibility and put pressure on Israel to stop its aggressive and provocative policy towards Lebanon," according the official news agency Ani. IDF officials at the Northern Command, meanwhile, admitted that a probe into Sunday's events would most likely reveal a lack of preparation on the army's part. But one official told Ynet that the violence had ended with relatively few victims. "Other results may have caused a very sensitive situation with Syria," he said. Early Monday morning large forces from the Engineering Corps began to mend the fence along Syria's border, but the official said it was clear to all involved that if the IDF wanted to prevent such future events, more than technical reparations will be needed. The fence is currently backed by a small scattering of mines that proved largely ineffectual during Sunday's infiltration. 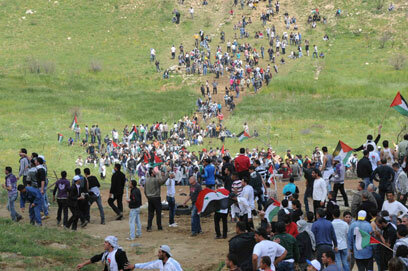 "Nothing prevented the Syrians from rushing at the fence and crossing it," an IDF official said. See all talkbacks "Israel files complaint against Syria, Lebanon"